But hold up! Buying recreational or hunting land in Virginia can be a very different experience than buying a typical single family home. Asking the right questions can make all the difference. We’ve compiled this list to help you find the perfect piece of land for your needs (and to help you avoid unwelcome surprises down the road). Has the land been surveyed recently? Are there any zoning or deed restrictions? Could the land be divided into smaller tracts? Is the land wooded? If so, is the timber marketable? Does the land offer a pond, stream or river access? If so, is it stocked? What kind of wildlife can commonly be found on the property (deer, bear, turkey, etc.)? How do you access the property (paved road, dirt road, gravel road, bridge, etc.)? Are there currently any hiking, ATV or horse trails on the property? What is the water and septic situation? Is the adjacent land privately owned or does it adjoin the National Forest? Are there any conservation easements? Does the property offer open fields/pasture land? Are there any buildings on the property? Do the buildings have value or is the listing price primarily based on the value of the land? What are the hunting regulations in the area? What are your options for financing? 29 acres of prime recreational land for sale in Millboro, VA – Click the photo for more information or contact Jeff Black at (540) 463-2016. 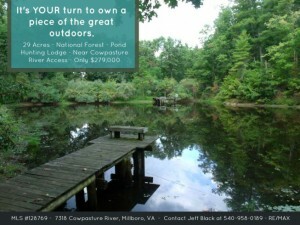 Is it time for YOU to own a piece of the great outdoors? Would some fresh country air, mountain views and a little outdoor adventure do you good? (Of course it would!) Purchasing recreational or hunting land can fulfill your need to reconnect with nature. Lexington Real Estate Connection’s agents can guide you through the entire process. They understand the intricacies of rural land ownership and will help you find the peaceful country retreat for you. Ready to search for hunting or recreational land for sale in Rockbridge, Bath and Alleghany Counties? We’re here to help when you’re ready to explore the possibilities. Contact our office today at 540-463-2016.